If you’re planning a party in Westchester County, New York, look no further than A and B Tent Rental for all your party supply needs. Located in the Mahopac area, we offer a wide variety of premier-quality rental tables and chairs for rent for all occasions. We proudly serve Putnam, Mahopac, Yorktown, Bronxville, Pleasantville and other communities throughout Westchester County, as well as neighboring Putnam County. Our chairs and tables available for rent are of excellent quality, and our staff takes the utmost care to keep them clean and well-maintained. Plus, our very affordable prices will help keep your event on budget while providing an exceptional experience for you and your attendees. Whether you’re hosting a wedding, engagement party, anniversary party, graduation party, birthday party or business luncheon, our professional staff will work with you to determine your needs, and get you the perfect chair and table arrangements, tents, and other party rentals you need to ensure your event is a success. We pride ourselves on our dedication to providing exceptional customer service and excellent products at prices that won’t break the bank. Our goal is to be your go-to source for high-quality rental tables, chairs and party supplies in Westchester County. 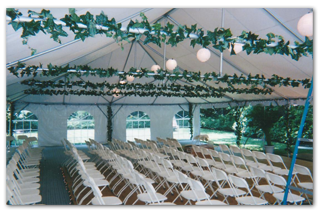 Find everything you need for your occasion with A & B Tent Company. Call us at 914-737-1659 or email us today to schedule your free, on-site consultation and make sure that your event is one to remember. Our most popular table. Seats 8 and up to 10 depending on chair style. A 90″ round linen will be 15” drop on the sides. These tables have so many uses. Seats up to 8. You can use these for bars, coffee and food stations, DJ tables, and seating chart arrangements. A 60″x120″ linen will have a 15” drop on the sides. Our most popular banquet table. Seats up to 10. Used as a bar, food and coffee service, catering prep tables, and family style seating or head table. A 20×120″ linen will have a 15” drop on the sides.